Ancient Greek Silver Tetradrachm - Herakles/Zeus Coin Pendant Circa 336 - 323 B.C. Coin was Minted During the Reign of Alexander III, The Great. Obverse: Head of Herakles right, wearing lion skin. 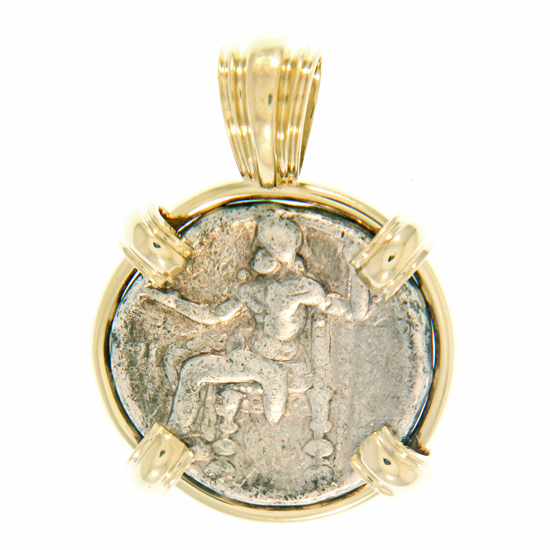 Reverse: Zeus enthroned left, holding eagle and scepter. Ruler: Alexander III, The Great; Mint: Sardes; Country: Kingdom of Macedon. Framed in 14Kt Yellow Gold.